(Reuters) - Paul Stirling and Ed Joyce came agonisingly close to centuries but still helped Ireland cause the first upset of the 2015 cricket World Cup with a four-wicket victory over West Indies at Saxton Oval in Nelson on Monday. Opener Stirling scored 92 and shared in a 106-run partnership with Joyce (84) while Niall O'Brien added 79 not out to guide Ireland to 307 for six in 45.5 overs after West Indies had scored 304 for seven. "It's obviously fantastic. The way we chased those runs was great. 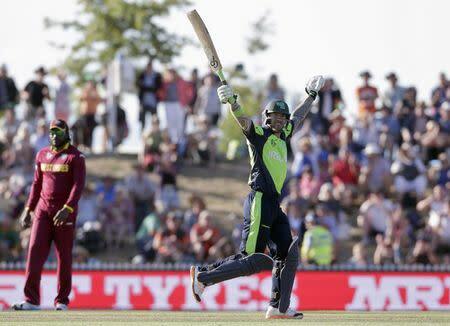 It sets us up for the next few games and it's a great position to be in," Ireland captain William Porterfield said. "We know what we are capable of and we believed going out the pitch today, that we could win not only this game but other games in the competition and we want to continue that." West Indies only posted a score in excess of 300 due to a counter-attacking century from Lendl Simmons (102), who combined with Darren Sammy (89) in a 154-run sixth-wicket partnership. Jason Holder's side had been in disarray before the tournament with off-spinner Sunil Narine withdrawing and the players involved in a bitter wrangle with their board over payments. Few expected them to seriously challenge for the title and with the loss to Ireland in their opening match, they could be in danger of not making the quarter-finals from Pool B.
Ireland also sensed they could upset West Indies before the game and were on top from the moment Porterfield won the toss. None of his bowlers are above medium fast but they took advantage of the pitch conditions and bowled tight line and length to strangle the West Indies top order. Spinners George Dockrell and Andy McBrine then clamped down on the scoring as West Indies failed to rotate the strike by accumulating singles and then lost regular wickets. Simmons and Sammy were forced together at 87 for five in the 24th over after the top order failures. They took their side through to the 45th over before Simmons and Andre Russell (27 not out) put on 61 to give West Indies a total they had never looked likely to achieve earlier. "It was a tough loss, putting 300 runs on the board we backed ourselves to defend it," said Holder. "We need to tighten up and be better in the games to come."